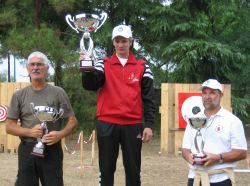 Now in its tenth year, the Big Throwers Meeting of the EuroThrowers was for the first time held as European Championship. 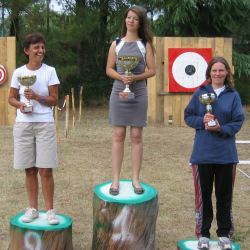 A total of 46 athletes from 7 nations (Italy, Germany, France, Russia, USA, Poland, Czech Republic) travelled several thousand kilometres to be part of this historic event1, to compete in knife throwing and axe throwing and chat with fellow throwers about the sport. There was a strong participation of Russia this year, with two groups from Moscow and Samara attending. 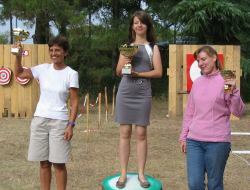 The last mentioned brought a gift for each thrower, and to the organisers presented a special throwing knife (see photo) and a medal with Samara-embossing. 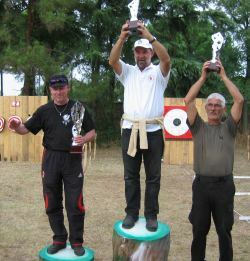 Locally, the championship was organised by the Italian throwing association Associazione Lanciatori Sportivi Italia headed by Americo Sabato, who had much help from his club colleagues, especially Eugenio Jonni. For the weekend, the archers club with which they share the area during the year ceded them some additional lanes for the competition targets. (If the schedule had not been so tight during the days, I would have loved to take the archery introduction offered.) 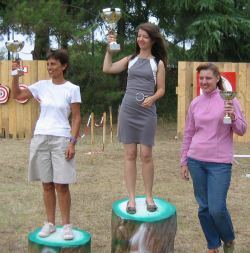 The organisation was handled very professionally, what with an extra 10 arbiters hired (five boys and five girls, from their looks selected to look good on the trophy photos) and all the efficient woman in the arbiter tent. The first international throwers started to arrive on Friday, and instantly began exercising on the training range. 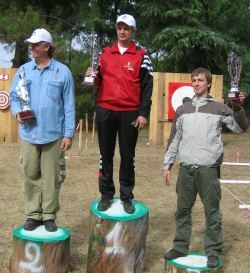 The 5 competition targets were of course off-limit. Some of the participants set up their tent on site (respectively their caravan, which one group from southern Germany had crossed the Alps with), others lodged in hotels in the vicinity. The usual bedlam of languages ensued, but most of the throwing-discussion can be accomplished non-verbally. And for the more complicated questions, you soon knew who can translate between which languages. 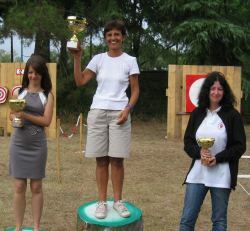 On Saturday, each participant had to officially register for the competition, with the forms and the European Knife and Axe Throwing Rules being available in multiple languages. Then each athlete was called by name, and drew a random starting number from a bag. All throwing ranges were being used in parallel, thus when a thrower finished his 21 throws, the arbiter could instantly call the next name on his list (it is astonishing in how many countries the name Michael is popular, and how many ways exist to pronounce it). Around noon, an Italian meal was provided (Primo pasta/lasagne, Secondo roast slices with bread, pickled vegetables), additionally a snack booth was open all day for small refreshments. In the early evening, all standard events were completed, and the throwers and their families went to explore Rome; Some stayed for a few days afterwards, to appropriately savour the Colosseum, the Palatine and the multitude of other sights of the eternal city. On Sunday, the weather looked rather double-minded, but contended itself with a short shower, which was quickly dried away by the sun. For the long distance event, the big 1m-circle-target had to be erected, for the lack of such huge trees constructed from 9 smaller quadratic blocks. 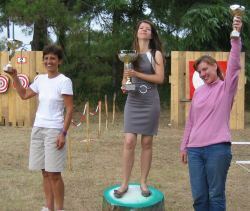 The rules for this event were explained in quite some languages, then one-by-one the throwers demonstrated their distance-sticking skills to a closely watching crowd (an axe stick from 19m was the furthest). When the red flag flew up, indicating that this perfect stick was outside the target circle, groans could be heard all over the place. 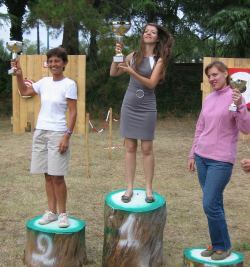 The award ceremony was held in the afternoon, with an impressive number of cups being provided by the organisers. As mandated by the rules since 2010, there was a separate rating for the women. 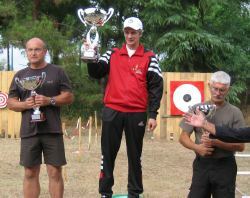 The skill level of the throwers in attendance was overall very high, the gaps between the top places thus very narrow. It was quite obvious that the international elite had come to this competition. 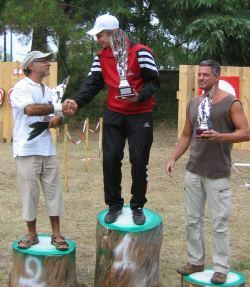 Two people deserve a special mention here: Richard Wesson (USA), who as first person ever reached 101 points (of 105 possible) in the 3m knife event, and Mickhail Sedyshev (Russia), who was awarded the title of the "total winner" by the organiser, due to his constant presence on the podium. I am very happy that I could attend such a professionally organised event! It was a pleasure to meet so many fine sportsmen and friends from all over Europe, to chat about the sport, and to throw together. I would be glad to see all again next year at the European Championship, which will be held in Germany or Moscow (will be decided at the end of this year). 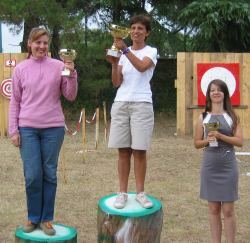 In the name of the EuroThrowers association, I'd like to thank again the A.L.S.I. 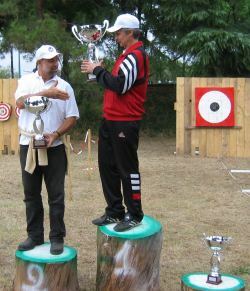 club around Americo Sabato and all the voluntary helping hands that made this championship in Rome happen. 1 "When I heard that Europe finally has an official championship, I simply had to go there", as Richard Wesson from North Carolina, USA, put it. AS: Americo Sabato, thank you for the thus marked photos. 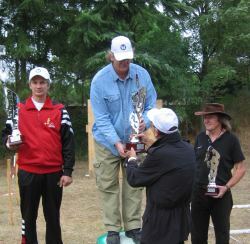 The organiser decided to award a price to the overall best thrower of the competitions. By far ahead of the competition, Mikhail Sedyshev (RU) could secure this honor.